Autocover NovoFine Pen Needles 30G 8mm. Case of 5 boxes. 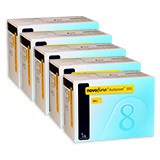 You are buying a Case of 5 Boxes of Autocover Novofine Pen Needles 30G 8mm, each box contains 100 pen needles - a total of 500. Novo Nordisk is a leading manufacturer of Pen Needles and diabetes supplies. At ADW Diabetes, we offer the complete product line of diabetes pen needles. Novofine® Autocover Safety Needles are designed to reduce needlestick injuries. Novofine Autocover® may help reduce needle anxiety, hurts less and is user-friendly. The needle on Novofine Autocover is encased before and immediately after injection, to reduce the risk of accidental needlestick injury for healthcare professionals and patients with diabetes. Accidental needlestick injuries are a serious but common occupational hazard in healthcare institutions, accounting for up to 80% of accidental exposures to blood. A sliding cover on Novofine Autocover hides the needle, retracts during injection, and re-covers the needle after injection. As many as 1 in 10 people with diabetes suffer from a fear of needles to the point where they actually avoid injections. The needle on Novofine Autocover is concealed, which may help relieve anxiety. Thinner needles, like Novofine Autocover, cause less bleeding, bruising, and pain. Novofine Autocover reduces inflammation and tissue damage. Re-use of a dull or damaged needle may increase the sensation of pain and can cause inflammation and tissue damage as needles loose their original sharpness; the smooth silicone coating may be gone, and the tip may be bent. By preventing needle re-use, Novofine Autocover may help avoid these potential problems. Novofine Autocover stops needle re-use and are designed to reduce risk of cross-infection. Novofine Autocover has a shield that locks in place automatically after use, preventing the needle from being used more than once. Novofine Autocover needles were designed for the Novo Nordisk line of diabetes pens and fits all major diabetes pen devices.